The program is organized around ten original Tang Soo Do combination sets developed by Grandmaster Ah Po. The techniques included in the combinations are generic to most "hard style" Karate systems. 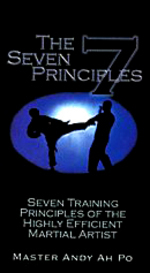 However, the video's primarily focuses on introducing serious martial arts students and practitioners from all disciplines, to Grandmaster Ah Po's unique training and teaching methods which are incorporated in the seven training principles listed above. These training principles, which were previously only shared with Grandmaster Ah Po's personal students, can now be available to you.